2. 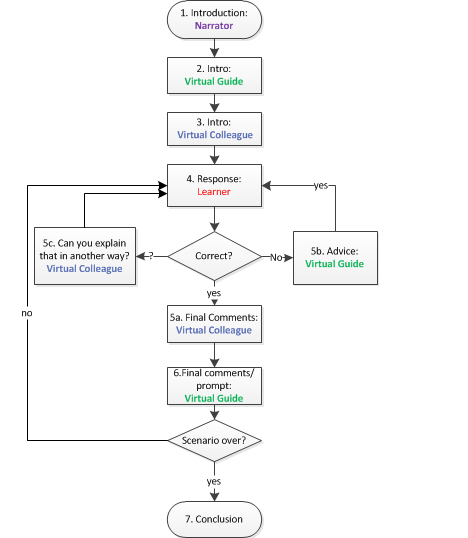 The Virtual Guide (the Angel in this case) gives a context, and a prompt for the learner, explaining what he or she needs to do to progress the scenario – where the learner interacts directly with the colleague. 3. The Virtual Colleague interjects (usually saying something that the learner will respond to – however in this instance the Colleague role is played by the Devil, so the student is talking to the Angel and is trying to ignore the Devil). 4. The learner needs to type something here to progress the scenario (there are limits to how often they can attempt an answer – if they fail totally this phase will be flagged as an issue in the final report). a. The colleague will respond if the learner gets the question right. c. The colleague will ask for clarification if he/she doesn’t understand the response. 6. The guide will come in and make observations, and prompt the learner to respond to a new question by looping back to the step 4 until the end of the scenario, when the system moves to step 7.